Education Queensland’s geographically isolated distance education schools have participated in the Partners in Learning “Training SDE Reading Coaches” trial, supported by Remote and Rural Branch in conjunction with the Reading Centre. 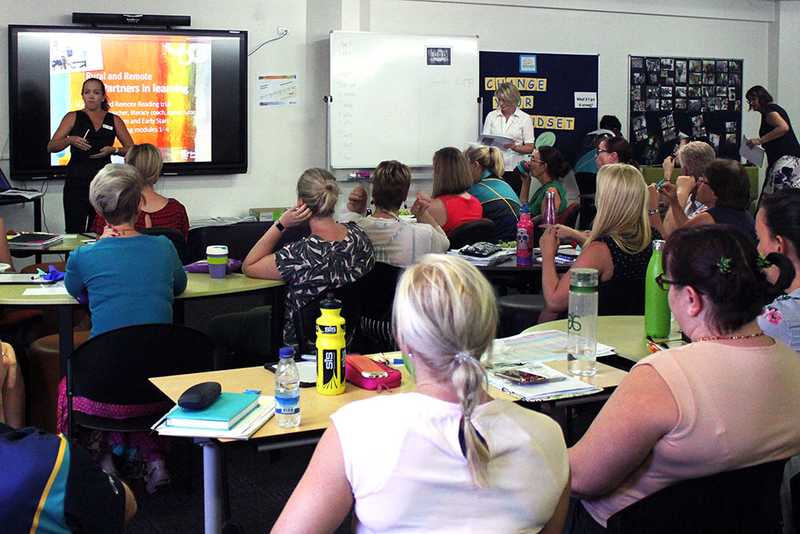 For Capricornia School of Distance Education, the program is headed by two Literacy Coaches and aims to increase capability and confidence of Home Tutors to teach students to read, support teachers in monitoring student literacy behaviours and individual goal setting, and improve reading outcomes for students. Approximately 70 Home Tutors participated in two full days of training where they learnt about the essential components for learning to read, stages of reading and strategies, as well as opportunities to view teaching vignettes, investigate case studies and play with hands- on activities that build reading skills. The Home Tutor training builds knowledge from the ground up, exploring the developmental indicators of phonemic awareness and phonics skills with a strong base of oral language as the building blocks for success with early reading. Teachers of all year levels also participated in ‘Learning to Read’ professional development, with an emphasis on monitoring literacy across all subject areas and setting individual literacy learning goals in collaboration with Home Tutors. Having a strong ‘whole school’ focus on reading, that is inclusive of all stakeholders, including Home Tutors, is proving to be a valuable and strategic pathway to improving reading learning outcomes.